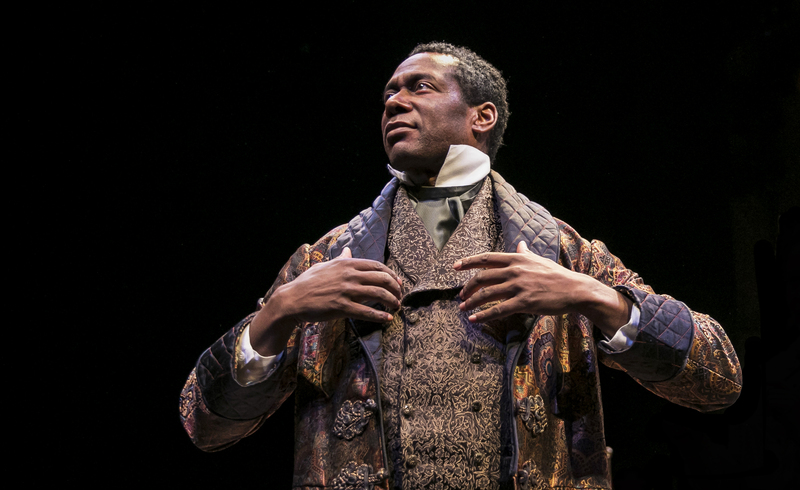 Ira Aldridge (Dion Johnstone) made history as the first black actor to play Othello on the London Stage in 1833, explored in Chicago Shakespeare Theater’s production of Red Velvet, directed by Gary Griffin, in CST’s Courtyard Theater, December 1, 2017–January 21, 2018. Photo by Liz Lauren. 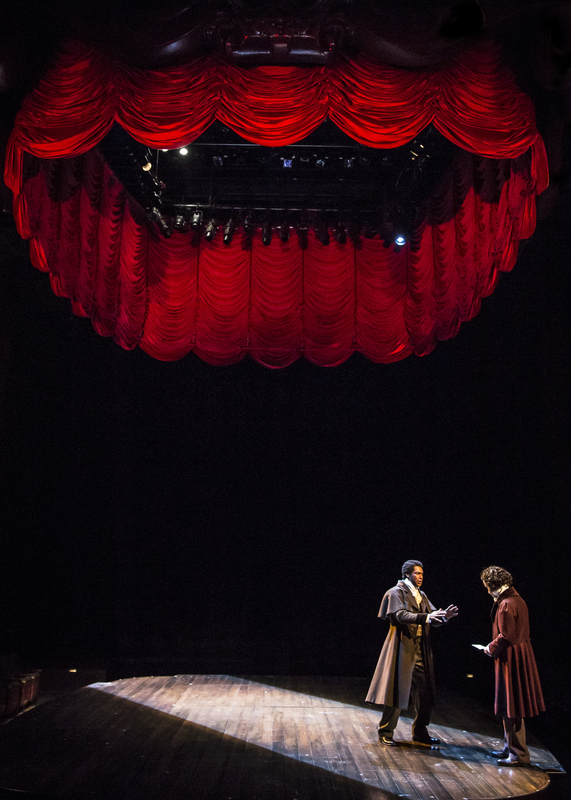 Ira Aldridge (Dion Johnstone, at right) implores theater manager Pierre LaPorte (Greg Matthew Anderson) to reconsider his decision in Chicago Shakespeare Theater’s production of Red Velvet, directed by Gary Griffin, in CST’s Courtyard Theater, December 1, 2017–January 21, 2018. Photo by Liz Lauren. 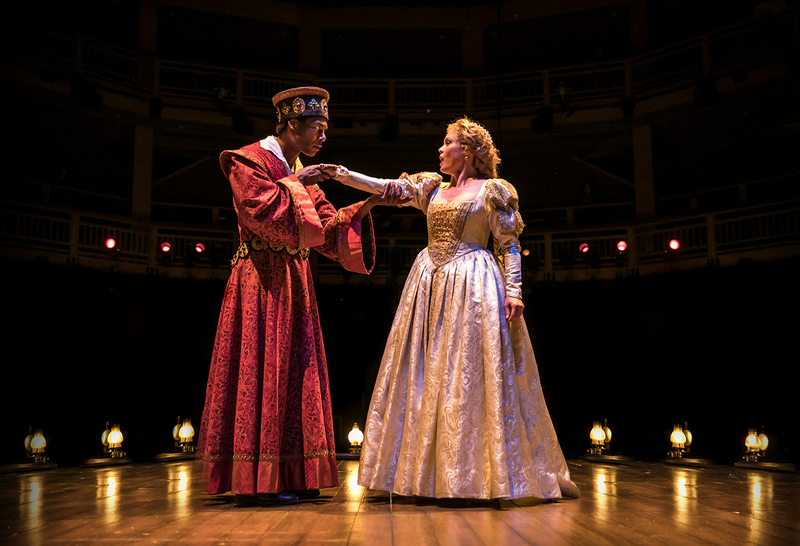 Debuting in Covent Garden’s 1833 production of Othello, Ira Aldridge as Othello (Dion Johnstone) shares the stage with actress Ellen Tree as Desdemona (Chaon Cross) in Chicago Shakespeare Theater’s production of Red Velvet, directed by Gary Griffin, in CST’s Courtyard Theater, December 1, 2017–January 21, 2018. Photo by Liz Lauren. 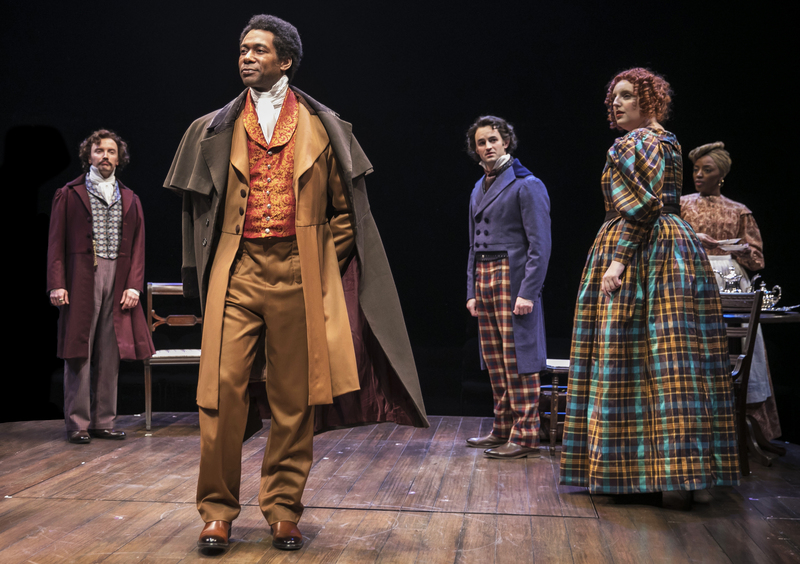 Ira Aldridge (Dion Johnstone, at center) shocks company members (from left: Greg Matthew Anderson, Jürgen Hooper, Bri Sudia and Tiffany Renee Johnson) when he is announced to replace leading actor Edmund Kean in the title role of Othello in Chicago Shakespeare Theater’s production of Red Velvet, directed by Gary Griffin, in CST’s Courtyard Theater, December 1, 2017–January 21, 2018. Photo by Liz Lauren. 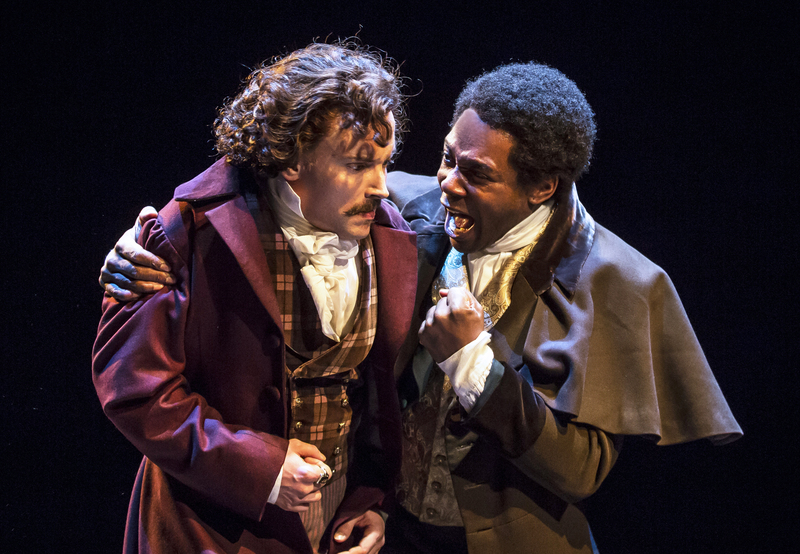 Ira Aldridge (Dion Johnstone) faces Pierre LaPorte (Greg Matthew Anderson) in Chicago Shakespeare Theater’s production of Red Velvet, directed by Gary Griffin, in CST’s Courtyard Theater, December 1, 2017–January 21, 2018. Photo by Liz Lauren. 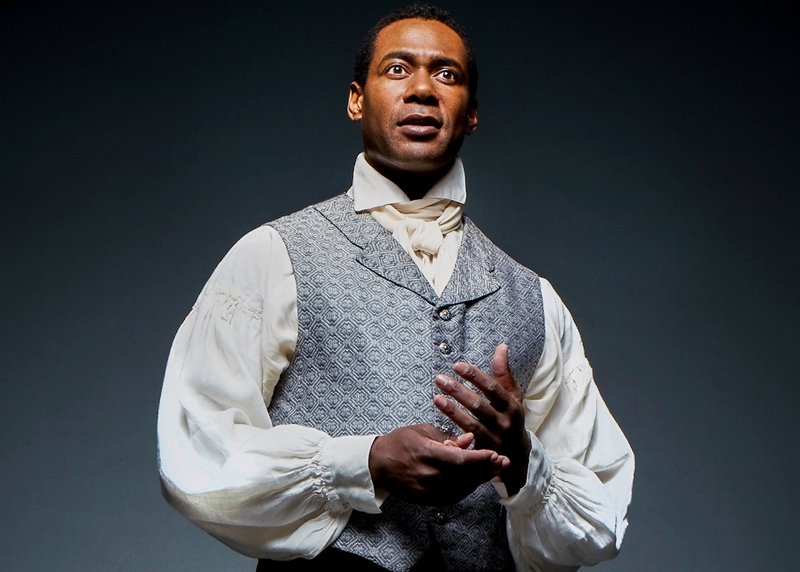 Celebrated Stratford Festival performer Dion Johnstone portrays trailblazing African-American actor Ira Aldridge, whose Othello shocked nineteenth-century London, in Chicago Shakespeare’s Red Velvet, directed by Gary Griffin, in the Courtyard Theater, December 1, 2017–January 21, 2018. Photo by Jeff Sciortino.